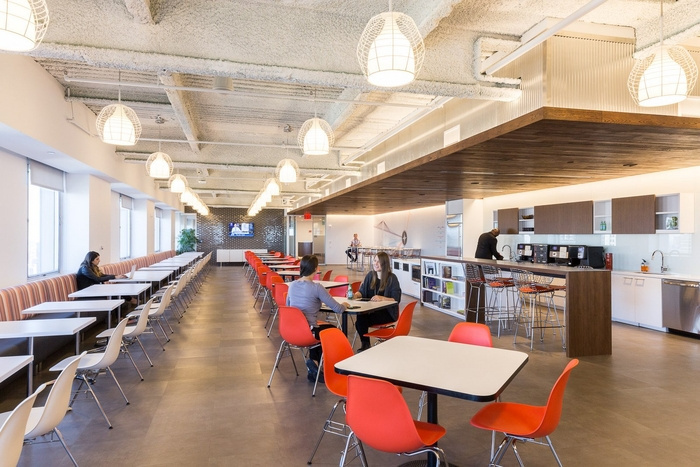 TPG Architecture has developed the new offices of publishing company Macmillan Publishers located in New York City. TPG was engaged by Macmillan Publishers to design a 177,000 square foot new office space at 1 New York Plaza. This new open-plan office accommodates around 1,000 people and provides ample conferencing and meeting facilities. The programming process was made up of three phases. The first phase involved a study and analysis of Macmillan’s recently completed London campus and development of planning standards. The second phase consisted of a written questionnaire that was distributed to all departments throughout the organization. The third and final programming exercise was in-person interviews with key business leaders. In conjunction with this programming process, TPG prepared space plans based on Macmillan’s new space standards and desired ratios of two collaborative seats for every designated seat. Macmillan’s new space features an expansive reception which includes a central staircase that connects reception and the workstations on the upper level. One the right side off reception is a large conference room suite, while the left side leads into a large pantry, which features moveable seating, as well as beautiful views of lower Manhattan and 1 WTC. Each floor features an open workspace that is broken up by higher benches that allow for collaboration. Additionally, on each floor there are color coded huddle booths which feature whiteboard walls, phones and privacy booths.